Round 27 comes from a very wet Reepham Fishery this week. Only 13 members turn out this week which was a surprise as this is one of the best places we fish. Never the less the brave souls who turned up were all hoping to get a few bites. Mark Charlwood drew the flyer peg 27 again this week and made no mistake taking first place. Mark had suffered the previous week but he well and truly made up for that this week. Mark weighed a very good 86lb 12oz on a very hard day. You can’t keep him down for long. 2nd place was Trevor Dodson. 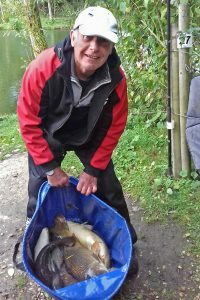 Trevor was fishing peg 13 and weighed a good 51lb ( not unlucky for him).3rd place goes to last weeks winner Mark Harmer. Mark fished peg 8 and weighed 49lb 11oz (so I messed another good peg up ?￰). Most others caught a few carp but the weather just didn’t help today. And there was just one D’N’W this week. Next week is the last summer match of 2018 from cobbleacre.